Harare, Zimbabwe, 5 November 2018/ /- Greenlight Planet, the global leader in solar home energy products is pleased to announce that its partner, Zonful Energy a leading pay as you go (PAYG) company in Zimbabwe set an impressive record of distributing 10,000 Sun King™ solar home systems in a short span of four months. Zonful Energy, in partnership with Greenlight Planet, distributes and finances solar home lighting solutions including the Sun King™ Home 60 & Sun King™ Home 120 Plus for households in Zimbabwe that lack adequate access to the electric grid. Greenlight Planet’s Sun King™ Home range offers comprehensive energy solutions, complete with up to four hanging lamps, a USB port for mobile charging, portable radios, and a motion sensor security lamp to provide light and charging capabilities for fundamental household electronics. The Sun King™ Home series also features a five-year battery life and a two-year warranty. EasyBuyTM, Greenlight Planet’s pay-as-you-go technology, is embedded in the Sun KingTM home systems. 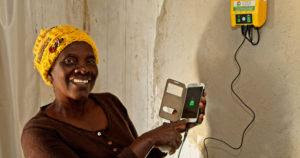 Zonful Energy has distributed these systems to 10,000 Zimbabwean households, affording customers the ability to pay for the same in small, affordable installments over time. Dhaval Radia, Global Business Leader, for Sun King™ EasyBuy™ at Greenlight Planet said: “Approximately 80% of Zimbabwe’s population lives without access to the electrical grid; that is a significant percentage of the country’s population relying on unhealthy and potentially dangerous energy sources such as candles, kerosene, batteries and firewood. Our partner, Zonful Energy, is not only selling reliable solar products, but also extending a service that improves the social and economic indicators of these communities. “This milestone was only reached by listening to our customers and understanding their needs. Focusing on our customer brought us to this milestone we are celebrating today; about 10,000 new signups in four months alone. Across every industry, almost nothing will have a bigger impact on our business than listening to the people we serve. When we listen to our customers, we can create new opportunities on our own terms, instead of fighting for space in a crowded ring. As Zonful, we care about helping our potential 17 million off-grid customers to become more productive families.” William Ponela, CEO, Zonful Energy, said. Zonful Energy, which leverages local leaders to educate households and influence sales, conducted a countrywide campaign and successfully covered seven out of Zimbabwe’s eight provinces. Fifty rural agents have been recruited to coordinate the customers in their respective areas, and more than one hundred rural technicians have been trained and employed to help customers install the Sun King™ Home systems.